This Pearl of Eternity is, First, the Light and Spirit of God within Thee. Secondly, This Pearl of Eternity is the Wisdom and Love of God within Thee. Thirdly, This Pearl of Eternity is the Church, or Temple of God within Thee. Fourthly, and Lastly, This Pearl of Eternity is the Peace and Joy of God within Thee. The kingdom of heaven is like treasure buried in a field. The man who found it, buried it again; and for sheer joy went and sold everything he had, and bought that field. Here is another picture of the kingdom of heaven. 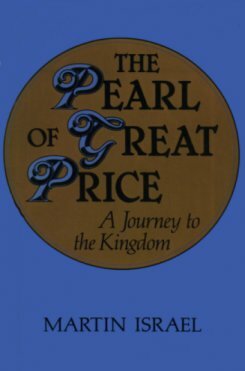 A merchant looking out for fine pearls found one of special value, so he went and sold everything he had and bought it (Matthew 13.44-6). The feature that these two Parables of the Kingdom share is the personal renunciation needed to acquire the precious article; it cannot simply be seized, but has to be left alone until the time when the purchaser is ready to use it properly. If it were acquired without a sacrifice its value would be lowered in the eyes of the seeker and soon it would be defiled. It is a rule that, for most of us, the price adds to the value of an article; only an aware person can fully appreciate a gift. Our health is taken for granted until we have survived a serious illness, just as a true friend may be discovered only when someone, whom we had barely noticed, comes to our aid quite spontaneously in a time of trouble, while those on whom we had relied reveal their ineffectiveness. In the search for the precious pearl the seeker is led into strange adventures, in the course of which he must be ready to yield everything on which his life had previously depended: material security, emotional relationships, religious conviction that is usually identified with faith, reputation, and finally his life itself. It follows that this awe-inspiring theme tends inexorably to chart the course of the seeker from the first glimpse to the threshold of the great prize. It is a spiritual journey that is being recorded and the theme cannot but assume something of a practical account of spiritual direction as the aspirant is guided day by day. The great saints are the beacons on the path, but we must beware of the temptation of trimming our own particular personality to theirs even to the extent of belittling or disparaging our own special gifts. As we progress on the path, so the precious pearl changes its situation: we see it in a progressively more personal light. Our quest changes us so that we become more precious in our own integrity, and the pearl assumes the nature of an inner light as well as a distant destination. When we are healed of inner disorder, we ourselves can provide the chalice into which the wine of God may be poured. The wine itself is changed into the person of Christ, whose sacred heart is the pearl. To its precincts we proceed with awe and quiet joy. In the end we find the pearl in our own hearts as we give of ourselves in love to serve the world around us.